The prospect of dating after 40 can strike horror in the hearts of many women. Even though some look, feel and are better than when dating in their twenties, many don’t feel they look their best. They know true beauty is what’s inside, but they don’t feel they are given a chance when the media –and many midlife men — idolizes hard bodies and youthful faces. So how do you make dating delicious? Delectability is as much about your attitude as it is about appearance. A tasty date can be at a high-end restaurant, but it could also be a walk in a park. Scrumptious dating is more about how you feel about yourself and the person you’re with than what you’re doing or eating. Yes, it helps if the activity is something fun or interesting. But if you have a curious, positive attitude, almost any outing can be interesting. I’ve had fabulous dates without venturing beyond my neighborhood coffee house. No matter what the outcome of a date, it’s no reason to ruin your day. If it was a good date, I like to celebrate with a square of premium chocolate, like Ghirardelli’s Gourmet Milk Coconut Rendezvous. And if it wasn’t a great date, it’s a perfect reason to have some Gourmet Milk Sea Salt Escape™. I can’t think of any dating experience where chocolate doesn’t make it more delicious. If you date like a box of chocolate, you’ll want to understand how to ethically see several men at once. 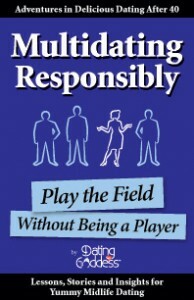 So get your copy of Multidating Responsibly: Play the Field Without Being A Player. I think that dating for anyone of any age starts with knowing what you want. Once you know what you want out of life and out of a relationship, it’s easier to sift through the empty wrappers and get to the really good pieces. When I started dating, it was two nutty people getting together, like Ghirardelli Coconut Rendezvous. Since then, there were some Toffee Interludes and Espresso Escapes mixed in with the Hazelnut Heaven’s. As my palate has become more discriminating, when the Evening Dream does come along, the intensity can increase rapidly when wondering if she is my Twilight Delight. I must be careful though not to let the extremes of Creamy Devotion and Midnight Reverie cloud my experience of the natural beauty of the lady in all her Luxe. Richard — you are very clever and funny! I adore this comment “Scrumptious dating is more about how you feel about yourself and the person you’re with than what you’re doing or eating” its so true. I agree with Allyson. This advice would be good for anyone dating. I even think especially people in their twenties. I think that when youth and beauty is always at your fingertips you can often overestimate it’s importance. I think our vanity can always use a good reality check and our inner selves can always be given a boost in our priorities. Previous post: Alpha male — or just jerk? Next post: Is “I’m sorry” a good thing or a bad one?